Alright.. so I'll explain this in both my introductions, but my name Wolfie Fang also has another meaning behind it... Being Gemini, I use it as an excuse to have Twins (sorta). Wolfie and Fang! This is Wolfie! He is a wolf, and he represents a lot more of me then I want to admit. He tends to show of my kinks more, my wants, my courage (which i don't have). 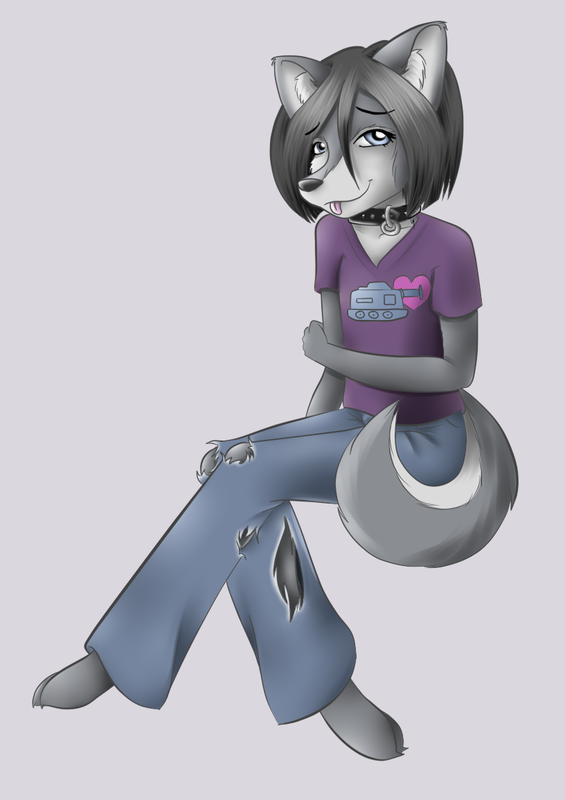 Wolfie is ever changing, and tends to represent my current status with a bit more courage then my actual self. My love of tanks is well represented here too with a very... interesting... tank. Oddly enough, this is the lightest version of Wolfie anyone has ever drawn for me... I usually end up a lot more Black. It was actually part of a two sided badge... that didn't quite come out as we had both planned. I loved it all the same! In the end we had both of them sitting on clouds with their names on opposites sides of the badge.